My silverback gorilla in the last issue, was the first in a batch of wild animal projects that I have prepared for my class. This issue was due to be a rhinoceros, but myself and my students felt that this may be too big a jump from the reasonably simple stuff which we normally try to produce on the course. 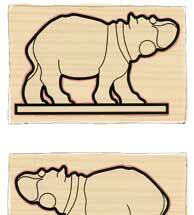 With this in mind, we settled on something a little less tricky - Harry the Hippo! 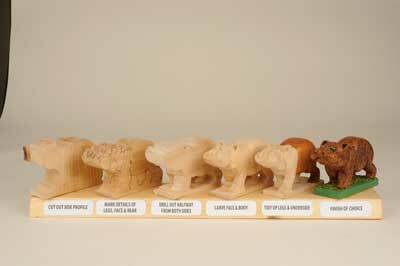 Let's start with the hippo storyboard. Take a block of lime 150 x 100 x 50mm (6 x 4 x 2in), but of course, you can opt for a bigger or smaller piece, depending on the scale in which you wish to carve. a bandsaw, fretsaw or similar. Once you have your outline, mark out the profiles and features as illustrated. I set my drill to 25mm (1in) - if you do not have a drill stop device, secure masking tape to the required depth so you can see where to stop. The first part to tackle is the head and face and for this, I used Flexcut knives and palm tools. The first cuts are made to establish the nostrils by cutting four V trenches between where the eyes will be to the front upper lip, and by removing the surplus from the outer edges. Next, establish the 'three furrows'nostril arrangement and then carve the round, pea-shaped eyes, before moving on to shaping the ears - this will allow you to 'slope'the front of the head back and past the ears. Next, carve out the inside of the ears with a series of triangular stop cuts using a detail knife. The cheeks are very rounded and globular, but are shaped quite easily with a shallow gouge and knife, and the mouth is formed with a simple arching cut with a V-tool from below the nostril to the outer cheeks. 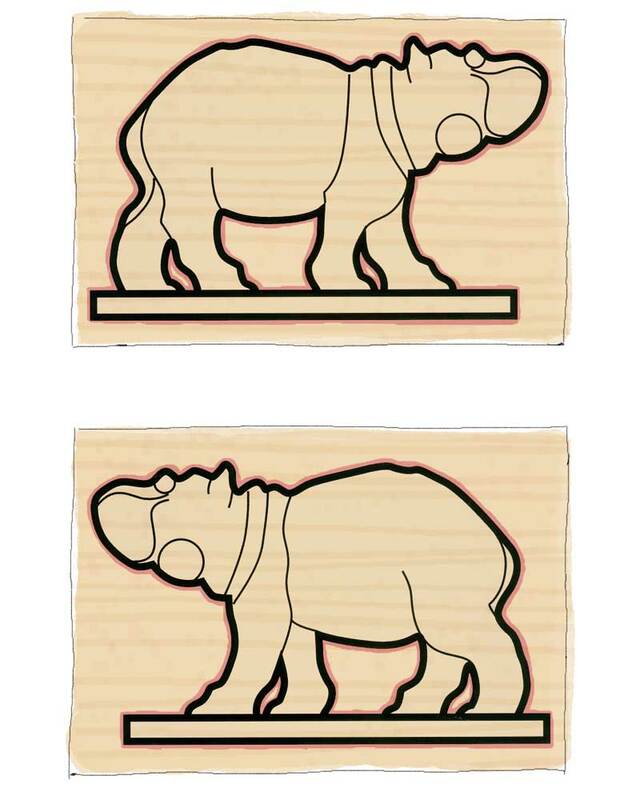 The same V-tool is used to carve the outline cuts for the collar from the back of the neck and around the chest, culminating in a Vee between the front legs. Round the body off using a selection of knives and palm tools. The rear end just needs the tail to be carved on the inner edge of the left rear leg, and wood removed from between the rear and front legs - a small drill is the best bet here. 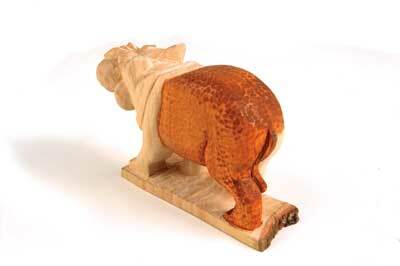 Once you are happy with the shape of your hippo, you can then finish it in the style of your choice. I chose to use the labour intensive method of pyrography - whilst very satisfying, this took me longer to complete than the carving itself! For my class, I prepared an alternative finish, which in effect, is a tooled finish that is oiled and burnished, and gives a very good impression of a rough hide. 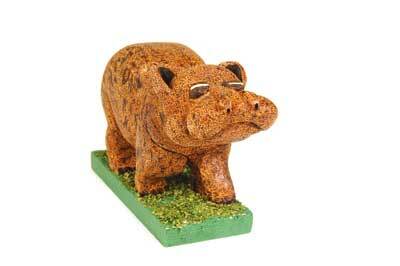 The hippo is mounted on a block of wood covered with small leaves, usually used by model railway enthusiasts, and are available from local hobby shops.